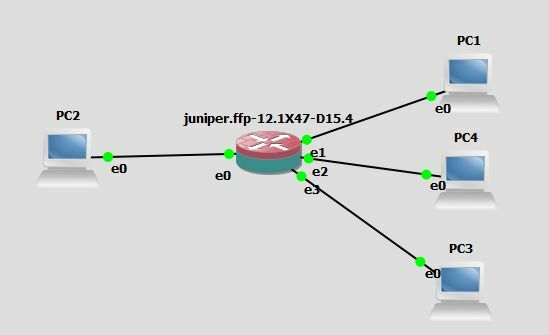 In a previous post, I showed how to create a Virtual Box VM of a Juniper Firefly Perimeter. It worked great, but some steps where quite difficult for some users and there seemed to be many that had issues with getting interfaces to appear and connect. Also, converting VM disk images was a pain. Fortunately, I found another extremely simple way to create the VM in only a few steps, and that was Vagrant. I had not used Vagrant before today, so it was a bit of a learning curve about what this tool does, but turned out to be very simple for what I needed it for. After installing Vagrant it was as simple as two Vagrant commands and I had my VM up and running. Many of the steps below were taken from my previous post with a few minor modifications and the replacement of the VM creation steps. Note: These instructions are run on this system. 1. Create a directory to store the vagrant files. Once it finishes downloading, booting and configuring, it will print out the details on how you can SSH to the vSRX. Try it out by logging in as root with default password Juniper. Be patient, the configuration might take a minute to connect to the VM. 3. Turn off the vSRX VM. 4. If you look in Virtual Box now, you will see a new VM with a really long strange name. This is your new vSRX VM. First thing is to rename the VM to something more recognizable like juniper.ffp-12.1X47-D15.4. Now to do some more testing, I am going to use GNS3 and add the vSRX in. 2. Add the vSRX VM to the VirtualBox VM list in preferences. 3. Select the juniper.ffp-12.1X47-D15.4 VM from the list and click finish. 5. Add the juniper.ffp-12.1X47-D15.4 and four VPCS to the canvas. 6. Start the vSRX and connect to console. 7. Login and configure the interfaces. For this test, I am configuring ge-0/0/0 as the outside untrust interface(which is the config default) and the other three interfaces will be added to the trust zone. 11. Test that PC1 can get out but PC2 can’t get in. So that is it for this alternative to creating a Juniper Firefly Perimeter (vSRX). Hope this way is a lot less troublesome than the previous method of converting VM images. This post ‘Installing Juniper Firefly (vSRX) in VirtualBox using Vagrant’ first appeared on https://techandtrains.com/. Something that I have been looking for, for a while, has been a nice software switch that I can use that support not just switching but VLANs as well. Yes, there is Open vSwitch, but I was looking for something more traditional, if that’s the right way to say it. I heard about Arista’s vEOS switch a while back, but back then you could only download it if you were already an Arista customer. But recently I ran across another great blog post at Radovan Brezula’s blog again that shows how to setup Arista’s vEOS and that’s when I found out that I could download vEOS to try without being an already Arista customer. I swear, this guy likes playing with virtual networking as much as I do. So below I’ll walk through my steps for setting up vEOS in VirtualBox and then putting it into GNS3 to do some basic VLAN tests. 1. Download vEOS from https://www.arista.com/en/support/software-download . You will need to create an account. The boot is a little slow to start the first time. Just wait a minute or so. When it finishes and you have the Login: prompt and you can login with ‘admin’ with no password. Make sure the base-vEOS is shutdown and remove the Aboot-veos-serial-2.1.0.iso from the CD. I had issues cloning while the CD was still attached. My test is going to use two switches, so I cloned(linked clone) base-vEOS two times. vEOS-1 and vEOS-2. Add Aboot-veos-serial-2.1.0.iso back in to each cloned VM. 6. After adding both VMs, choose the each VM one at a time in the VM list in the preferences and click on the Edit button to set the following. 7. 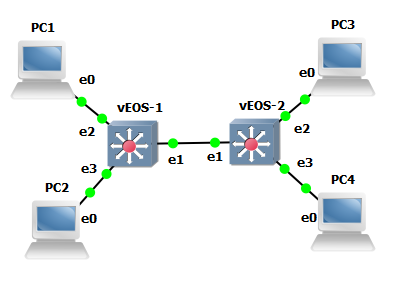 Add both switches to the GNS3 canvas along with four VPCS. Now start up all the VPCS and vEOS switches. After they start up, configure the switches to have a trunk between them and set the interfaces to the VPCS to be access. To test VLANs, I’ll put PC1 and PC3 in one VLAN and I’ll put PC2 and PC4 in another. Well, it works great and does what I need it to do for a special test I want to try out, which I hope to post within the next month. Enjoy everyone and thanks again to Radovan Brezula. This post ‘Installing Arista vEOS in VirtualBox and GNS3’ first appeared on https://techandtrains.com/.